As I was reading this chapter, I noticed how humility and faith go hand in hand. Once we start to understand Who He is, we begin to understand who we are, and where we’d be without Him. The difference between the proud and the humble is that the humble recognize their sin. They are in desperate need of a Savior. The proud unfortunately, are blind to their sin, which leads to their demise. What does verse six reveal about the centurion’s character? What do verses 7-8 reveal about his faith? Verse 6 reveals that he was humble. Verses 7-8 he had great faith in Christ’s authority over sickness and health. How did Jesus describe John the Baptist? And how was he different from Christ? That John was not well dressed. That he wasn’t easily swayed, meaning that John was firm in his faith. That he was more than a prophet. He was different from Jesus in that he came to prepare the way for Jesus Christ. John was merely a man, while Jesus was the Son of God, born of a virgin. The truth of God can easily be taken away from us in a number of ways. One is that it’s often distorted by others who try to sway us away from the truth. If we don’t have a deep understanding of truth, and if we’re not grounded in that truth we aren’t protecting our hearts like we should be. It’s always wise to surround ourselves with strong believers who sharpen our faith and watch out for us. Another way that people lose the truth of God’s word is by taking their eyes off of the Lord and allowing this world to distract them. Money, power, and lust are some of the things people chase after forgetting the truth they once held so dear. And yet another way is the many times we yield to temptation when we know that we shouldn’t. One step in the wrong direction, is one step further from God. It puts us in a dangerous and vulnerable place where Satan can further tempt us. Who were the women who travelled with Jesus, and how did they help? They helped by contributing financially to the ministry. Although it says from their “substance,” which could be wealth or other possessions. What do the birds, the seeds, the soil, and the thorns each symbolize? The soil is the heart. The seed is the Word of God. The birds are the devil who takes the truth from our hearts. And the thorns are the cares of this world. What does a lamp on a stand represent? The light is the word within our hearts, and the lampstand is sharing that light with others. If we hide the light within our hearts, we might lose it. Where did they meet the demon-possessed man? Why was his name Legion? His name was legion because he had many demons within him. The country of the Gadarenes, which is over against Galilee. How man people did Jesus raise from the dead? Can you list them? Lazarus, the widow of Nain’s son, and Jairus’ daughter, and Jesus. There are so many reasons to believe that Jesus was who He said He was. Word of His miraculous power spread throughout the land. Thousands upon thousands of people witnessed the miracles that He performed. His disciples were witness to His to glory, and saw Moses and Elijah with their own eyes. Later we read how many were witness to His death and resurrection. They saw the nail prints in His hands. The tomb was empty. Still people refused to believe He was the Son of God. What power did Jesus give to the twelve disciples? The power and authority over demons and sickness. What were they instructed to leave behind while on their journey? Nothing. They weren’t supposed to take extra shoes, they weren’t supposed to pack anything unnecessary. They were to go as they were. What are some of the rumors that Herod heard in verses 7-8? He had conflicting reports that John (who he had beheaded) had risen from the dead, that Elijah had appeared, or that another prophet had risen from the dead. Where did the feeding of the 5,000 take place? A deserted place in Bethsaida, but it wasn’t deserted long as a multitude of people followed Him. We must be willing to deny ourselves of our own passions and desires to follow Him. When we take up our cross, we exchange the person we were for the person He is—in other words, we die to ourselves so that we might live for Him. Why was it important for these three disciples to witness the transfiguration? First of all, I think it’s important to understand what a transfiguration is. Basically it’s a transformation of the body from the physical to a spiritual form. It was important for some of the disciples to see this, and to also hear the voice of God so that they could later bear witness of His glory to the rest of the world. Who appeared with Jesus at the transfiguration? What does Jesus reveal about His upcoming anguish and death in this chapter? He said that He would be delivered into the hands of men, but they didn’t understand what that meant at the time. Verse 27 is key to understand the rest of the chapter. It’s at the heart of both the parable of the Good Samaritan and the story of Mary and Martha. When we love God with all of our heart, everything else falls into place. We’re not called to take the easy road–we’re called to take the road less travelled. We’re instructed to love our enemies and to do good to those that hurt us. We’re taught to love as Christ loved, and to serve as He served from a place of sacrifice and grace. How many disciples did Jesus send out in this chapter? Why did he instruct them not to take a purse, a bag or sandals? My understanding of this, is that because they were representing Christ, they were to walk as He walked, and deliver the message as He would Himself. And so we see that He wasn’t encumbered by the things of this world. He was focused on nothing but His mission. He came into this world with nothing, and He left with nothing. On every step of His journey, He relied on the provision of God. He wanted to teach His disciples to also be fully reliant on God and focused on their mission. Who were the three people who passed by the man on the road? The Jews and the Samaritans had long been at odds with each other. What significance, if any, does that have with this story? In 2nd Kings 17, Elah was king of Isreal. He ruled in Samaria for nine years, until Assyria attacked Samaria and took the people into captivity. Because Israel was so wicked at the time, God allowed them to be exiled and removed from their land. 2 Kings 17:24 tells us that foreigners replaced the Israelites and settled into their land where they worshipped false gods and lived very sinful lives. Skipping forward to to the book of Ezra chapter four. Tens of thousands Israelites returned from exile in Babylon to Jerusalem, with an assignment from God to rebuild the temple. This history is significant to this parable because the Samaritan wasn’t simply a random guy, he was the enemy. The Levite and the priest on the other hand were their very own people. Not only did the Samaritan go out of his way to help someone, he went out of his way to love an enemy. When you love God with all of your heart, you learn to love as He loves–not only when it’s easy or convenient to us, but when loving someone is the most difficult thing that you’re called to do. That’s what being a Good Samaritan is all about. Jesus told Martha that Mary chose well. What did she choose? What is the one thing that we all need to put first? Quote the scripture found in this chapter. Mary chose to sit at the feet of Jesus. She knew that He was the most important part of her life. She prioritized Him before anything else. She was dedicated to Him. Martha on the other hand was the one who invited Jesus into her home. Since we’re told that Mary “also” sat at the feet of Jesus, we can assume Martha did too. The issue wasn’t that she didn’t love Jesus, but that she was troubled about many things. Sometimes we can get so preoccupied with life that we forget how important it is to fellowship with God. He needs to be our first priority. Everything else that we do is an extension of that love. God doesn’t need our prayers; in fact, He knows our desires before we even open our mouths. But He wants our fellowship, our persistence, our prayers… He wants to commune with us one on one, as a father spends time with his son. And so He asks that we knock and keep knocking day after day, coming to Him in prayer, with much praise and thanksgiving. He wants us to seek His will in our lives and to recognize His hand at work. He wants us to trust Him for provision as a child put trust in his parent. He wants us to forgive, and to love as He loves. What does the Lord’s prayer teach us about the way we should pray? That prayer is more than just making requests, it’s also an opportunity to praise our Father for the amazing God He is. That we should be asking that God’s will—whatever that might be–would be accomplished both in our lives and also in the rest of the world. That we should be trusting God to supply our needs every day. That we should ask for forgiveness. That we should forgive others as God forgives us. That we would be kept from temptation, and that we would turn our backs on all that is evil. What does the story of the three loaves teach us about prayer? That we should be persistent in prayer. What 3 things does verse nine tell us to do? What do you think these three represent? Ask. Seek. Knock. This represents persistence in prayer. He wants us to ask for our gifts–for healing, for provision, for the salvation of others, for peace, etc… God knows our every thought, but He wants us to share our thoughts with Him in prayer. Seek the will of God when you pray, not merely your own. What you might think is good for you isn’t necessarily God’s will for your life. Look for His hand at work, and be ready to accept it. Knocking is our persistence in prayer as we come to God again and again. Who does Jesus define as blessed in verse 28? Those that both hear the Word of God and do it. What can we learn from verse 34? If you combine this verse with the one following, you’ll see that Jesus was talking about protecting the light that’s within you. The light is our understanding of God’s Word. The Bible tells us, “Thy word is a lamp unto my feet, and a light unto my path.” (Psalm 119:105) And so we see that the Word of God, and our understanding of it, is our compass. If we aren’t seeking the truth of God’s will, and if we’re not taking in the truth, we’re following darkness. In order to stay on the right path, we need to keep our candles lit at all times by filling our thoughts with God’s Word. When people are more concerned about what others think, than they are about pleasing the Lord, they fall prey to hypocrisy. Saying one thing while doing another, they conceal their sin for a season. Everything will be revealed, He says, and every word spoken will be heard. Therefore we must fear God more than we fear man. It’s interesting to see how Jesus speaks about the danger of hypocrisy and judgment in one verse and goes on to stress the depth of God’s love in the next. Here’s the thing, God doesn’t want us to fail. He doesn’t want a single one of us to perish. He loves us so much that He sent His only begotten Son to die for our sins. He cares more for us than we could ever understand. Why is hypocrisy compared to yeast in verse one? Hypocrisy like yeast may be concealed for a time, but can not be hidden forever. As the dough rises, so does sin where hypocrisy is present. Hypocrisy is a spiritual pitfall. Many yield themselves to temptation, nurturing sin behind closed doors. Jesus warns us not to fall into this trap, as God is very much aware of the sin we conceal. What does this chapter teach us about the incredible love of God? The fact that He knows the number of hairs on our head is just one of the many ways He looks out for us. I don’t think we could ever begin to imagine that kind of love and compassion. He provides for us in the same way that He clothes the lilies of the field. Anytime we open our eyes, we witness the provision of God, and still we worry, when what we should be doing is trusting in Him. What can the parable of the rich fool teach us? That the things we treasure so much on this earth are passing away. This home and everything in it is temporary. We have a home in heaven where the treasure is great, and life is eternal. What hope does this chapter offer to those who worry? That you can put worry aside, knowing that God will take care of tomorrow just as He took care of today. You need only to look at nature to see the compassion and the goodness of God. Jesus talked about a “baptism of fire.” This fire was the suffering He was soon to endure on the cross. Up until this time, multitudes had followed Him, thousands came to worship Him and to be healed, but the time was coming when few would be left standing by His side at the cross. He would be immersed so to speak in the suffering that was to come. And then He would rise from the dead to join His Father in heaven. This fire brings persecution and in many relationships, also division. What does this chapter teach us about preparing our hearts for His coming? We don’t know when Christ will return. It could be tonight, it could be tomorrow… and so we must live our lives with an attitude of readiness. If our hearts aren’t right with God, we need to make them right. We need to repent and to live the righteous life God calls us to live. Anything that we think we’re doing in secret will be revealed. Hypocrisy is a pitfall we need to avoid. I am really loving this bible study!!!! With the specific questions for each chapter, I am really diving into the Word and coming up with questions of my own to go find answers to. Am I missing your thoughts on Luke 7 questions: What can verse 22 tell us about the purpose of miracles? 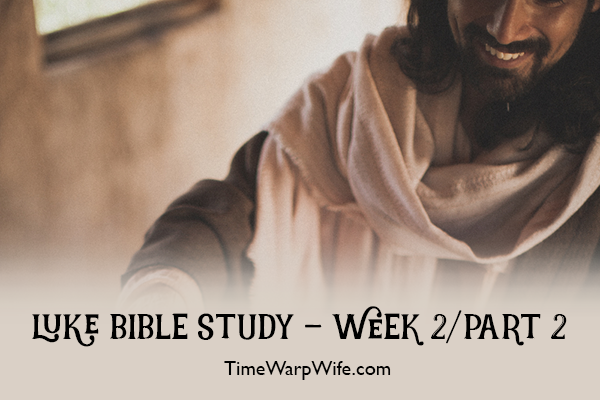 and What did the woman offer Jesus that the Pharisee didn’t? I swear I have scrolled back and forth and didn’t see these two questions addressed. Thank you so much for all you’ve shared. I am so grateful.